The joy dances in her eyes as she recalls the defining moments from her childhood. She can see herself walking through the neighborhoods of Holy Trinity Parish on the near west side of Indianapolis in the 1950s—growing up in a family where her mother and grandmother shared secrets in the Slovenian language, growing up in the Catholic school where the Franciscan sisters in their habits welcomed her warmly, growing up in the parish church where she sang in the choir on summer mornings at the 5:30 a.m. Mass and brought baskets of hard-boiled eggs to be blessed by a parish priest on Holy Saturday. Like the savory smell of the Slovenian walnut bread—potica—that she still makes, it all comes back to Franciscan Sister Jackie McCracken, enveloping her in the warmth of her childhood blessings. “It’s a huge part of who I am, who I’ve become,” she says with a satisfied smile. That same smile and that same sense of joy return later when Sister Jackie adds the details of the woman she has become at age 66—an advocate who has worked to help victims of domestic violence, a teacher who has led high school students to deepen their faith through service, a program coordinator who now directs college students in internships that help them discover God’s call in their lives. For Sister Jackie, it’s all part of her incredible journey of becoming the woman that God envisioned her to be—a life journey that she considers still full of possibilities. While Sister Jackie says that the child she was wouldn’t recognize the religious sister she has become, the ties that connect them are still evident. As a student at the former Holy Trinity School and the former St. Mary’s Academy in Indianapolis, she was fascinated by and felt close to the Franciscan sisters who taught her. “They were always very friendly, very open, great teachers, great role models,” she says. She has the same positive feelings about being in community with her fellow religious sisters in the Third Order of St. Francis in Oldenburg. 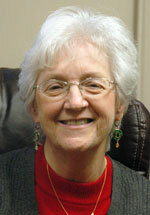 She taught religion and English at Cardinal Ritter Jr./Sr. High School in Indianapolis in the 1970s. She has served as the communications director for her order. For 14 years, she had various roles as an advocate for female victims of domestic abuse, from being there for women during court proceedings to training judges and lawyers about the issue of domestic violence. She was also the executive director of Indiana Campus Compact, part of a national organization that promoted service learning opportunities for college students, faculty members and presidents. She worked at Cathedral High School in Indianapolis from 2008 to 2010, helping teachers imbed the concept of service into their classes. She now serves as a program associate for the Indiana Network for Higher Education Ministries in Indianapolis, helping college students explore faith-based career possibilities. All those qualities and experiences show the heart that Sister Jackie has for others, according to Franciscan Sister Barbara Piller, congregational minister of the Sisters of the Third Order of St. Francis in Oldenburg. Sister Jackie recommends her choice of vocation to women who want to dedicate their lives to God and make a difference to others as part of a community of women who support each other. “For any young woman, this way of life offers a broadening of perspective, an opportunity to grow in a multitude of ways, and the opportunity to see yourself as a rich, vibrant participant in the human race and the human questions we all have,” she says.